EpiBone is participating this week in the BioFabricate conference, an international gathering at Microsoft Technology Center in New York City to showcase cutting-edge progress in what we can build with living materials. So I’m feeling extra celebratory about the growing synergy between biology and design. At EpiBone, we’ve solidified the connection between creativity and science with our artist-in-residence program—that’s what we’re spotlighting at the conference. But we’re hardly the only ones blending art and science. In fact, it was a decidedly techie company that first inspired me to bring artists into our lab. When I visited San Francisco last February, the amazing Andrew Hessel of Project Cyborg fame invited me to visit Autodesk Research’s Pier 9 facility. And I saw so much cool stuff! 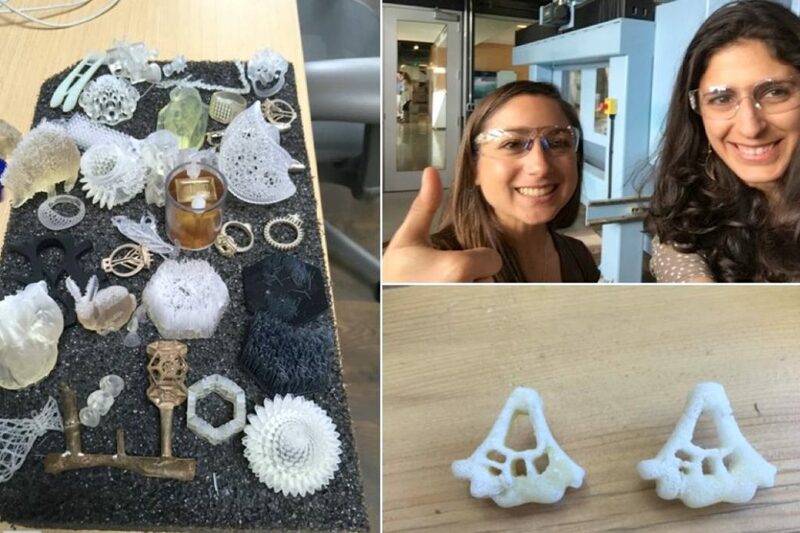 There were layered topographical maps, printed 3D portraits, spongy lattices, grassy plastic sheets of “cilia” and, of course, lots of 3D printed jewelry. There were knitting machines and CnC mills, and even, yes, a biology lab! Biology and design were inseparable. And I thought to myself: Why can’t WE have an artist-in-residence program, too? Who cares that we’re still a tiny startup with only three full-time employees? I’m sharing here my photos from that exciting day at Autodesk, so that you can be inspired, too. See if you can spot the bioreactor? As the BioFabricate conference makes plain, biology is becoming a design element. And we’re part of that trend, which is bleeding out of the lab into the wider world. We’ll be looking forward to hearing from many speakers, including Oron Catts of Symbiotica, the world’s first artistic biology laboratory, Andras Forgacs of Modern Meadow, growing meat and leather from cells, Ellen Jorgensen, Dan Grushkin of Genspace, the first DIY bio lab in the US (which is home to many artists), and David Kong, fellow co-instructor in the class “How to Grow Almost Anything.” Also the conference attendees will be able to get hands-on experience at the pop-up lab run by Nurit Bar-Shai, co-founder of Genspace, and our current artist in residence.